Improves engine performance, drivability and cold starting. Lubricates and extends life of fuel injectors and pumps. Forte Advanced Formula Diesel Treatment has been specifically formulated to combat drive ability concerns caused by the by-products of combustion and the adverse effects of fuel degradation. Forte Advanced Formula Diesel Treatment cleans and lubricates the whole of the fuel system both pre and post-combustion. It improves overall engine power and efficiency, as well as considerably reducing costly down time and component replacement in direct and indirect injection engines. Forte Advanced Formula Diesel Treatment is compatible with common rail direct injection and Pump Duse diesel engines. Forte Advanced Formula Diesel Treatment does not affect the cetane rating of diesel fuel. 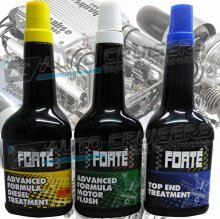 Forte Advanced Formula Motor Flush is fully compatible with and will not affect wet clutches. Forte Advanced Formula Motor Flush has been specifically formulated to combat the effects that extended oil drain periods and modern driving habits have on today's technically sophisticated engines. Urban cycle and start/stop driving patterns increase the rate at which acid builds up; leading to accelerated and premature engine wear. Excessive lacquer and varnish formation reduces the efficiency of oil system components, such as VVT systems, piston rings and Hydraulic Valve Lifters.